Should you prefer to use the phone, a direct call to 866-636-7111 and identify yourself as a member of the Mazda Group and use A5MZC05 as the ID number. To another year of Rototrheads getting together in Vegas visiting friends, making new ones and another memorable year …. The itinerary will be coming soon along with the Official Artwork and a link to purchase previous WHiV Swag !!! Last edited by 13x; 03-10-15 at 10:48 PM. Last edited by 13x; 03-10-15 at 10:24 PM. Last edited by 13x; 03-12-15 at 08:26 PM. A great meet and a great group of people - as well as a wonderful goal for us SoCal folk to get your car out of the city and on the open highway for a change. Cut off date for the room rates is coming fast ... just over a week ... so get those rooms booked for another weekend of rotary themed goodness and join us and our Sponsor/Vendors for WHiV8 !!! Booked. Now assembling my "must do before" project list. Mel, my plans are still up in the air; There's a small chance I may have to cancel. Number of work-related and home-related things I have to get done before I can break away for three days, and I have to squeeze in time for some fluids-maintenance work on the Beastie too. Nothing major, but needs to be done before that drive. I wasn't planning on joining the -8 caravan (didn't even know there was one); I tend to poke along and stop frequently, trying to enjoy the drive, when I drive the -7. Let's stay in touch as the date gets closer; My plans will firm up in the week before the event. are we there yet are we here yet???? Grrrrrr... predictions of rain here on Thursday, into Friday morning; it hasn't rained enough here to get a hummingbird wet all year, and now, NOW it wants to rain on the ONE DAY I need it to not rain between now and September? Rain will make an absolute mess of my car, because the roads out here are so dirty. Because it doesn't rain enough. Argh. Mel, if there's going to be weather in the area, my departure time is going to depend completely on 1) traffic, and 2) trying to find an hour to get north of the Pass when it's not raining. Which is to say, it will be unpredictable. 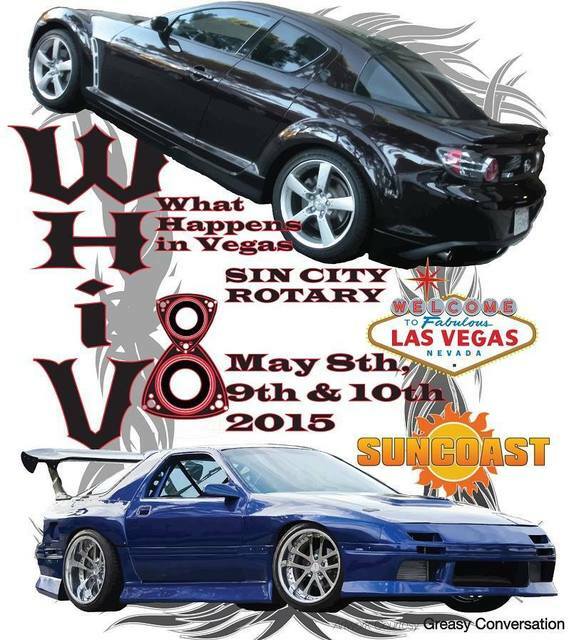 YOU WILL BE SUPPLIED MAPS OF THE ROUTE AND THE CRUISE WILL BE LEAD BY A MEMBER OF SIN CITY ROTARY IT WILL START IN THE MARQUEE LOT OF THE SUNCOAST AND RETURN THE THE SAME LOT. 8pm to 11:59pm- Get together in the suite at the Suncoast; all attendees are invited. 10am- There will be a short scenic cruise (approx. 1 hour) leaving from the Sun Coast parking lot followed by the annual barbeque, maps will be available. Details to follow. Not looking good Glen, i got a new assignment so Friday AM departure may not happen but i will be there for sure. Definitely will see you there! I may join up with the caravan in Victorville, or may just roll on my own; weather will be my main decider. Looks like a nice gap in the rain; rolling shortly! Is this going to happen again next year? When is the next one for 2016? Does this meet still happen? I see this thread is from 2016?